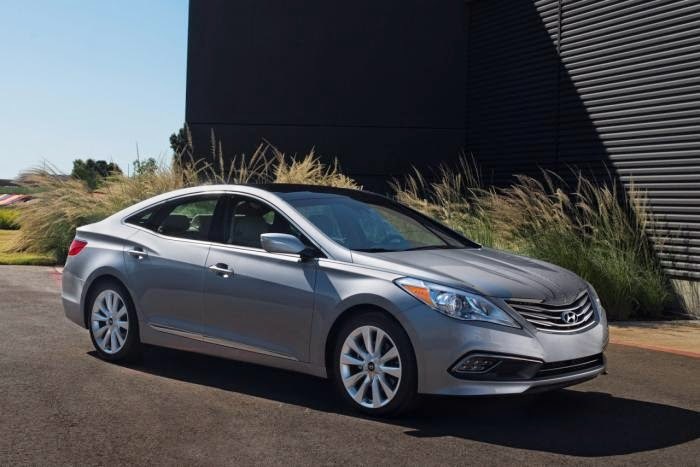 Hyundai has released new pictures and details about the 2015 Azera following its debut at the Miami International Auto Show. On the styling front, the facelifted model receives a new front bumper, a revised grille and LED fog lights (on Limited variants). Moving further back, there's a modified rear bumper and restyled 18-inch alloy wheels. The cabin largely carries over but there's revised switchgear, illuminated sill plates and an upgraded infotainment system with an 8-inch display. The latter gains an assortment of new features including Pandora capability, a split-screen display and an enhanced Google Point-of-Interest search function - among other things. The model also comes nicely equipped with a host of standard equipment including leather upholstery, a dual-zone automatic climate control system and heated front / rear seats. There's also a next-generation Blue Link telematics system. Speaking of technology, the 2015 Azera gains a standard Blind Spot Detection system with Rear Cross Traffic alert and Lane Change Assist. Limited variants go one step further as they have Automatic High Beam Assist, a Lane Departure Warning system and a Forward Collision Warning system. Motivation is provided by a 3.3-liter V6 engine that develops 293 bhp (218 kW) and 255 lb-ft (345 Nm) of torque. It is connected to a six-speed automatic transmission which should enable the model to return 19 mpg city / 29 mpg highway / 23 mpg combined.